Papakolea Beach is a green sand beach at Mahana Bay and one of the truly magical Hawaii beaches. Near South Point at the southern tip of the Big Island, reaching Papakolea Beach is a bit of a trek, but you will be rewarded for your efforts by breathtaking scenery and wide-open vistas. 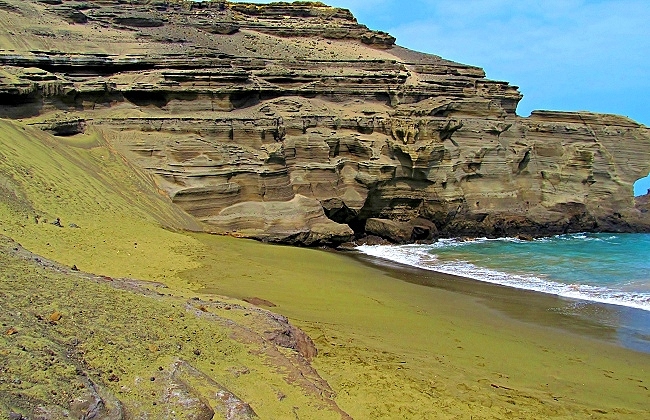 The only green sand beach in Hawaii and one of only two in the entire world, Papakolea is a real marvel. 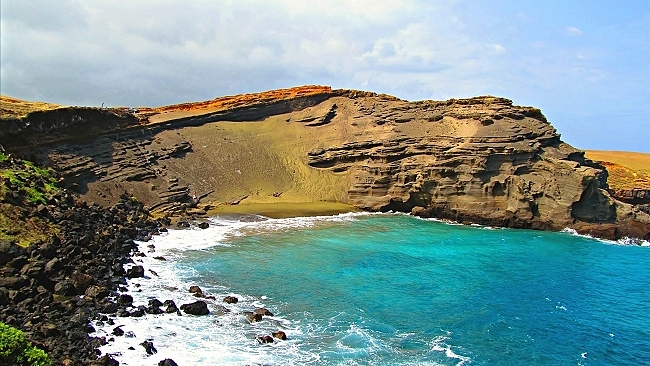 The green sand at Papakolea Beach comes from the mineral olivine found in the basalt of certain lava flows. This particular lava flow is from Pu'u o Mahana, an ancient cinder cone on the southwest rift of Mauna Loa Volcano. 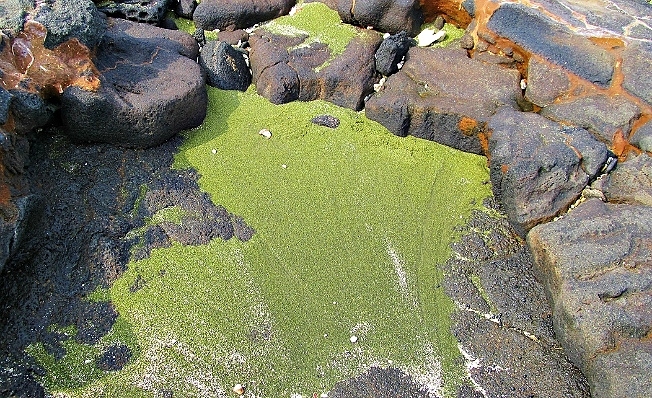 The olivine crystals at Papakolea have eroded from the basalt, and because there is such a high concentration of olivine in this particular lava flow, the result is a stunning green sand beach. This and nearby Punalu’u Black Sand Beach are two of the most unique Hawaii beaches you will encounter anywhere. As with all Hawaii beaches, the action of ocean waves over hundreds or thousands of years breaks down shoreline deposits, whether they be volcanic, coral or other compositions (even glass deposits dumped offshore will eventually be reduced to bits of sand). The hike to Papakolea Beach is about 2.5 miles (four kilometers) each way, across wide-open, hot and dusty coastal pasturelands. Wear plenty of sunscreen and bring lots of water. Depending on when you go, it may feel like a pleasant stroll, or more like a death-march if the sun is scorching hot and the wind is pummeling dust in your face. We try to go early in the day before the wind really picks up, with enough time to be able to enjoy lunch on the beach. Either way, take your time. Hike deliberately. There are rewards all along the way, with more to see than simply the green sand beach itself at your destination. This hike can be a real treat and our recommendation is to slow down, do a little exploring and discover all the hidden treasures along the way. One of the treats in hiking close to the coastline is occasional pockets of shimmering green sand, deposited where water has receded from the tide pools. In places the olivine gives the sand a glassy, gem-like quality. It is so vibrantly green it could almost be the remains of an undersea emerald city that has washed ashore. The image below was taken during a recent Student Travel program as we explored the coast with one of our small groups of teenagers. DO NOT REMOVE THE SAND! Resist the temptation to take any of the beautiful green sand as a Big Island souvenir. Not only is the supply limited, but the volcano goddess Pele has been known to wreak havoc upon visitors who remove green or black sand from her beaches! Don't say we didn't warn you. The coastline along here is raw and untamed. Waves crash along the jagged shoreline and send sea spray rocketing skyward. Periodically you will come across evidence of ancient Hawaiian civilization in the remains of the rock structures along the coast. Even with all the branches in the road that seem to ramble every which way along the path to Papakolea green sand beach, it’s not easy to get lost on this hike. Just keep the coastline on your right and eventually you end up at the beach. Papakolea Beach lies at the bottom of a large lava bowl carved out of the coastline. The trail to the bottom begins behind the beach on its western edge, with a steep descent that is often slippery. Before you venture down, check the surf and make sure the waves aren’t crashing clear up to the top of the beach. The reward for your efforts is breathtaking. While Papakolea Beach itself is relatively small, the scenery is stunning with the turquoise blue ocean, grey cliffs and green sand against a blue sky. Use extreme caution if you go into the water. The ocean adjacent to Mahana Bay is unprotected and waves can be severe. People do swim here. We generally choose not to, unless it’s super calm. It’s just too exposed, and the undertow is fierce during even moderate surf. There are plenty of other great Hawaii beaches that make for better swimming! 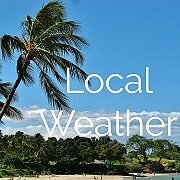 To reach Papakolea green sand beach, turn onto South Point Road between the 69 and 70 mile markers on Highway 11, approximately 6 miles west of Na'alehu. About 4 miles down South Point Road, take the right fork. As you near the coastline, approximately 10 miles from the main highway, take the left fork and continue less than a mile to the end of the road. The road is paved, but is very narrow and in disrepair. There are no facilities here, so plan accordingly. Bring plenty of water. There are frequently locals hanging out in the parking area with their modified four-wheel drive trucks offering to shuttle visitors to the beach for a small “gratuity.” We do not encourage this, as technically it isn't legal to drive to Papakolea. It is also not legal to charge for parking. Do Not risk trashing your own vehicle just because you'd rather not do the hike. We often see unsuspecting tourists with their Jeeps hung up on the rocks and huge ruts along the route. As you drive back the way you came, turn left at that fork you passed on the way in, just under a mile up the road. This is South Point, or Ka Lae, the southernmost point in the United States. Registered as a National Historic Landmark, it is believed Ka Lae is where ancient Polynesian explorers first landed in Hawaii sometime around 400-500 A.D. Remnants of one of the earliest Hawaiian settlements are evident in the ruins of an ancient heiau (temple) near South Point, and other artifacts between here and Papakolea Beach. Though swimming in the area is discouraged due to dangerous currents, you may see locals hurling themselves off the cliff into the crystal-clear water far below. Do you like Papakolea? Tell your friends on Facebook or Google Plus!